At Rozen Orthodontics, in addition to creating confident and beautiful smiles we are passionate about our community. We believe in giving back and proudly sponsor many community events, sports teams, schools, clubs and charities. Dr. Rozen and his family live and work in the amazing Parkland and Coral Springs area and feel a great responsibility to improve the lives of those around them by supporting local and national organizations. Proud provider for Smiles Change Lives a non profit organization helping families secure treatment for their children by connecting them with orthodontic providers willing to donate their services to deserving patients. Not my daughter, find a cure now is a local organization we hold very close to our hearts. With so many suffering from breast cancer, we strive to support this cause whenever possible. 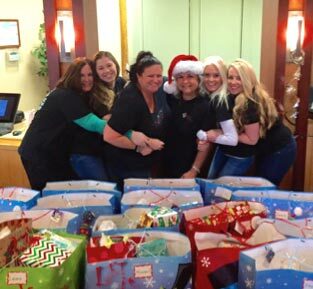 Every year Rozen Orthodontics brings clothing, toys and joy to the families and children of The Broward Outreach Center . This is a local organization that helps men, women, and children with meals, safe shelter, life-changing residential programs, employment, and housing resulting in transformed lives.